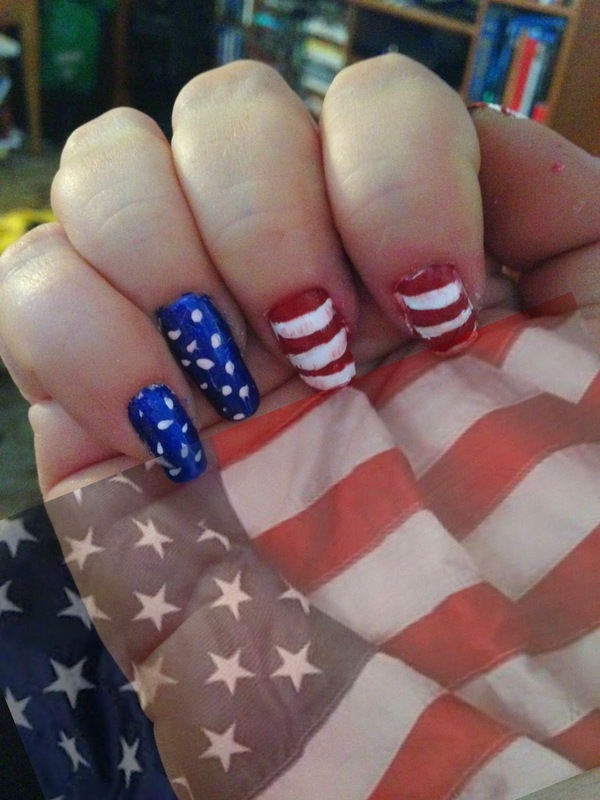 I posted my Canada Day Nails Pictorial last week and wanted to also share a nail design for my American readers! This was very simple and I thought it looked great! The only tools I used was scotch tape and a toothpick. Apply White polish to the thumb, pointer and middle finger. Apply Blue polish to the ring finger and pinkie finger. Cut scotch tape into thin strips. Apply the tape horizontally across the nails with white polish( make sure polish is completely dry, the tape will take off polish if it is not dry). I used about 3 - 4 strips per nail. Apply Red polish to the white nails. I like to wait 30 seconds then slowly peel off the tape. Using a toothpick dipped in white polish, apply small dots to the ring and pinkie fingers. Wait a few minutes and apply a generous amount of top coat. Now go and show your american pride! !